Here’s a snapshot of the line waiting to get into Abbott and Costello Meet Frankenstein at the Alex Theatre in Glendale, CA on October 25. Tough crowd! John King Tarpinian was on hand not just to see the movie, but to flash his replica of the Dracula ring Lugosi wore in the film. You all know how hard it is to find social occasions to wear your finery. 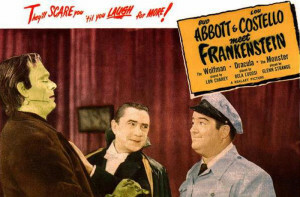 Bud Abbott and Lou Costello join forces with Universal’s menagerie of famous monsters… a perfect blending of classic comedy and terror. The boys were never funnier, combining verbal routines with their best slapstick gags. 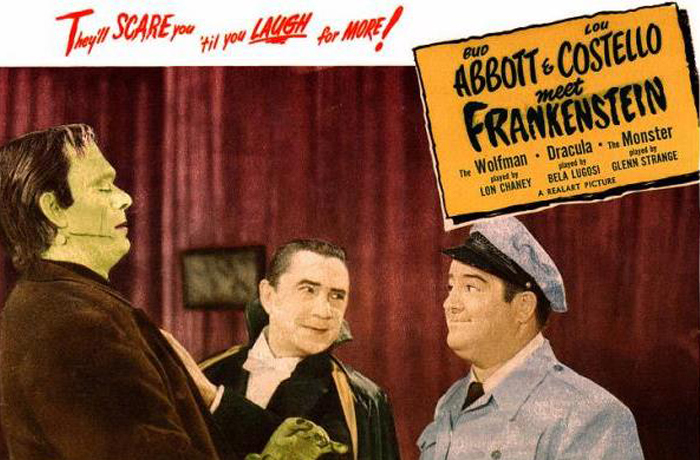 A top-notch supporting cast plays it absolutely straight, with Bela Lugosi as Dracula for only the second time, Lon Chaney Jr. making his full moon change into The Wolf Man, and Glenn Strange stalking the boys as Frankenstein’s Monster. Even Vincent Price gets a cameo as The Invisible man. This top grosser for Universal still holds all its charm. This entry was posted in Like Show Business and tagged Bela Lugosi, Dracula, Frankenstein, John King Tarpinian by Mike Glyer. Bookmark the permalink. Bela Lugosi, Jr. honored those who attended the evening’s performance. He talked about his father, of course, and gave a slide show on him on his father’s sets. I once had the honor of breaking bread with Jr. along with Sara Karloff and Ron Chaney at Musso & Frank’s Restaurant after Carla Laemmle’s 100th birthday party. 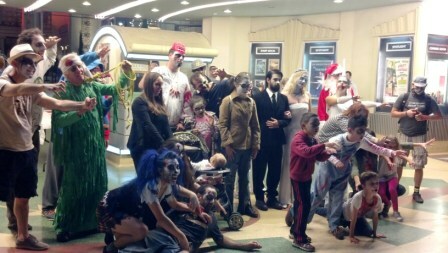 Yes, Ray Bradbury was there also. At the matinee performance Bud Abbott’s daughters were the guests of honor. By that point in time–the late ’90s–the dealers room was spread out across the main floor of the airport Holiday Inn. There was a main room, and across the other side of the hotel, several small meeting rooms filled with a few dealers tables. It was almost like, ultimately, exploring a warren of memorabilia. Suddenly, I was locking eyes with Boris Karloff. Beyond that passage, was an eternity of dreams. Because as Sarah Karlloff would be the first to tell you, her father’s immortal eyes live in her lovely face.